Manu Prakash PhD, from Stanford school of medicine has developed an origami-based paper microscope that costs about 30 Rs (50 cents). 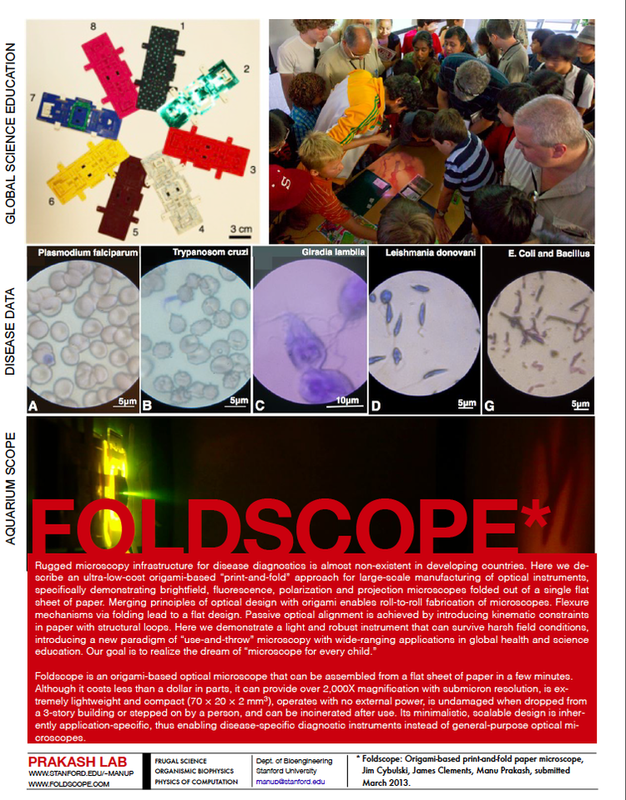 The microscope known as ‘Foldscope’ actually is a bookmark-sized piece of layered cardstock with a micro-lens. Widespread access and distribution of this ultra-low-cost paper microscopes so as to detect diseases like malaria, trypanasomiasis, schistosomiasis and Chagas, has been the dream of Prakash and he calls his model an ‘use and throw microscope’. It can be assembled in matter of minutes, has no mechanical moving parts, packs in a flat configuration, is extremely rugged and can be incinerated after use to safely dispose of infectious biospecimens. And impressively, with a few minor design modifications, it can be used for bright-field, multi-fluorescence microscopy. It differs from the conventional microscopes in that, unlike the ground curved glass lenses, it uses inexpensive spherical lenses, originally produced in bulk for industrial use to ease rough edges off metal parts. Specimens can be magnified up to 2000 times with this microscope and by adding further accessories like watch battery powered LED lights and fluorescent filters, it can be configured to project images on the wall for teaching / demonstration purposes. The idea is to assemble a crowd-sourced biology microscopy manual that includes examples of creative uses for his microscope, collected from the end users viz., scientists, teachers, tinkerers, thinkers, hackers and the kids who participate in this project. If you are interested to apply for a Foldscope kit, conceptualize ideas on how you would use the microscope and write to signup (at) foldscope (dot) com. Further details on submission and sample proposals are posted at Foldscope.com. Applicants with best ideas will received the kits from August 2014 onwards.